The Shanghai Gesture long ago achieved cult movie status. Thanks to the outrageous head gear adorning Ona Muson as the proprietor of a gambling den in Shanghai; thanks to the blatantly sexual desires of Gene Tierney as the gambling-addicted daughter of a wealthy industrialist; thanks to the degradation that Tierney endures; thanks to the absurd dialogue that simply has to be heard to be believed--for these reasons and many more-- The Shanghai Gesture has earned a niche in the pantheon of exotic cinema. After working with Marlene Dietrich on such marvelously composed vehicles as The Scarlet Empress, Blonde Venus, and Morocco, director Josef von Sternberg's career began to founder. By 1941, the year The Shanghai Gesture was released, Sternberg was directing fewer and fewer movies. Over the next decade, his only major directing stint would be as uncredited assistant director on David O. Selznick's Duel in the Sun. With Dietrich, however, his Hollywood movies found a near-perfect blend of visual sumptuousness and melodramatic intensity. The Scarlet Empress, for example, is one of the most beautiful movies ever made--and one of the most compelling portraits of the personal sacrifices that women must make when thrust into political office. But without Dietrich, Sternberg's movies became hollow artifices. 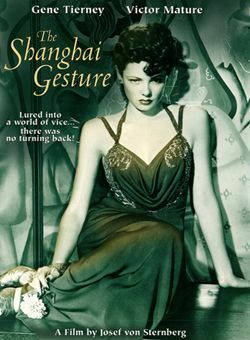 The Shanghai Gesture contains some hints of Sternberg's previous work, but most of his efforts are undone by poor casting, bad acting, and his own weak screenplay (based upon a stage play by John Colton). Gene Tierney plays the spoiled child of an industrialist, Sir Guy Charteris (Walter Huston). 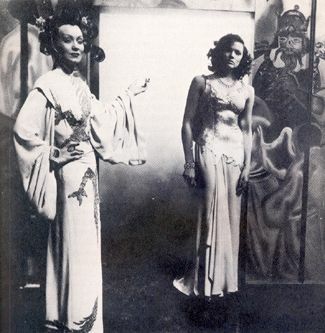 One night in Shanghai, Poppy (Tierney) stumbles upon the gambling den run by Mother Gin Sling (Ona Munson). Sporting one of the most outrageous hairdos in the history of cinema (huge swirls of hair arc away from her head like the frozen arms of an octopus), Mother Gin Sling lords over the movie as Shanghai's leading proponent of vice. Industrialists such as Sir Guy Charteris hope to run her out of business and then claim her land. And the government likes his plan because his efforts will clean up Shanghai's most notorious district. Mother Gin Sling meets the government dictum without wavering: "Every so often Shanghai decides to clean itself like a swan in a muddy lake," she says. "I shall not move and I certainly shall not close." She discovers Charteris' Achilles heal once Poppy is revealed as his daughter. Mother Gin Sling then helps ensure that Poppy falls under her control--which happens relatively easily. Poppy, as it turns out, can't resist gambling and the exotic pleasures offered by the gambling hall: "The other places are like kindergarten compared to this," she says, enraptured by the hall's smoky, crowded atmosphere. "It smells so incredibly evil … I didn't think such a place existed except in my own imagination." Poppy makes a drunken entrance at Mother Gin Sling's New Year's party in The Shanghai Gesture. One of the great delights in watching The Shanghai Gesture comes from watching as Poppy becomes further and further embroiled in a world of hedonistic delights. The movie quickly aligns the allure for Poppy as sexual: "Whew--somebody give me a cigarette!" she says after a particularly exciting few minutes in the gambling den. She professes that she can control her habits ("I can stop whenever I want to," she says with a pout), but we instantly see otherwise. In one of the movie's most decadent scenes, a drunken Poppy goes to the apartment of Dr. Omar (Victor Mature) and pleads for him: "Come on, honey," she brays. "Let me in!" She can't control herself. Her desires control her completely. And later, she confronts him at the gambling club's bar and throws water in his face: "I told you not to play with me," she says. But then she throws herself in front of him: "Please forgive me. I didn't mean it. Maybe I had too much to drink. I'm sorry. Don't be angry with me." Dr. Omar raises his cape as if he's a vampire, enshrouding Poppy as his lips descend upon hers. Tierney snarls and bawls her lines. Pauline Kael wrote, "Tierney acts as if she's having a tantrum in Schraffts over the fudge sauce." Mature acts as if he's trying to evoke memories of Rudolph Valentino. But instead, he looks sweaty and constipated. Ona Munson fares the best of the lead actors, in a role better suited to Marlene Dietrich. Munson doesn't have the same presence as Dietrich, which may explain her outrageous headgear. When she enters a room, the soundtrack music swells to orgastic levels. But, for once, Sternberg's visuals let him down. Without the overworking, bombastic music, the images simply show us Munson walking across a backroom or through the gambling hall. Sternberg has few surprises in store. There are no shafts of light on Munson's face. No candlelight reflected in her eyes. In one of the movie's few visual flourishes, Sternberg places women in cages outside the windows of Mother Gin Sling's New Year's party. "An appetizer for our male guests," says Mother Gin Sling. Men on the streets below bid for them while the men at the party wink and gawk. More frequently, however, The Shanghai Gesture tends to show its theatrical origins. The big confrontation--between Charteris and Mother Gin Sling at her New Year's party--takes up nearly a third of the movie's running time. But it locks us in the same room with the partygoers, allowing Sternberg few opportunities for his stylistic flourishes. When the movie attempts to build to a climax, all we get is ridiculous melodrama--unsupported by Sternberg's usual penchant for lush visuals. The Shanghai Gesture isn't a particularly good movie. Pauline Kael calls it "hilariously, awesomely terrible" and Danny Peary calls it "absolutely ridiculous," but it's a hard movie to stop watching. This new video transfer from Image Entertainment isn't pristine. This is definitely not a restored print. The soundtrack, in particular, is choppy and rough during the opening credits and elsewhere it occasionally sounds slightly distorted. But nonetheless, The Shanghai Gesture is still a fascinating, albeit frequently ludicrous, viewing experience. The Shanghai Gesture is now available on DVD and VHS from Image Entertainment. Suggested retail price: $24.98 for DVD and $14.98 for VHS. The DVD contains no extras except for the filmographies of Sternberg and the principal actors. For additional information, we suggest you check out the Image Entertainment Web site.